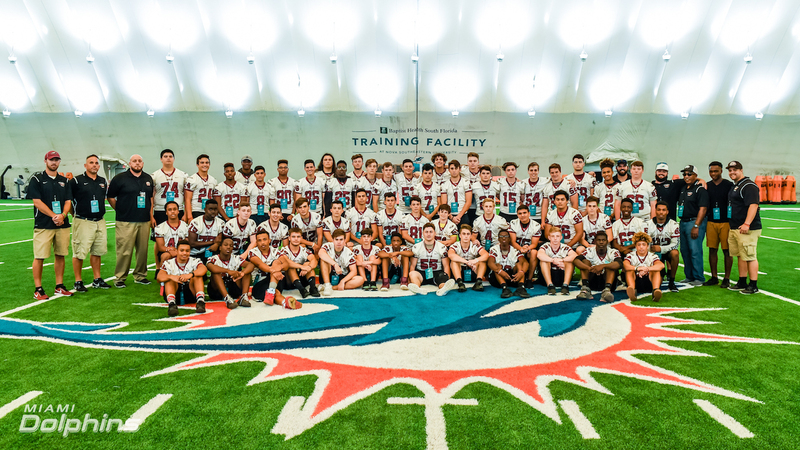 The Miami Dolphins hosted the Marjory Stoneman Douglas High School football team at their Organized Team Activity (OTA) practice. The team was given a tour of the Baptist Health Training Facility at Nova Southeastern University and heard from Miami Dolphins Vice Chairman, President & CEO Tom Garfinkel about leadership and teamwork. The Stoneman Douglas football team also had the opportunity to watch the Dolphins practice and meet with current players on the field. Following practice, the athletes had lunch provided by Publix. The Junior Dolphins program encourages youth players and coaches to teach, learn and play football in a fun and safe environment. The Junior Dolphins program is designed to give kids access to learn the fundamentals of football using the NFL’s top resources. To grow the game, the Junior Dolphins program will work to educate coaches, parents and youth on the health and safety of football with a strong emphasis on character development. Junior Dolphins is building the next generation of Dolphins Fans. When I'm not eating Chipotle or breaking ankles in these streets, I'm writing articles for Lemon City. I only spit alternative facts. Basketball is my bread and butter, but sports in general is in my DNA.